As a NASA astronaut, Garrett Reisman flew on the space shuttle twice, floated outside on spacewalks, and spent about three months living on the International Space Station. Now Reisman is hanging up his spacesuit to take a job with commercial firm Space Exploration Technologies (SpaceX), which hopes to launch NASA astronauts and paying tourists one day on its Dragon capsule and Falcon 9 rocket. 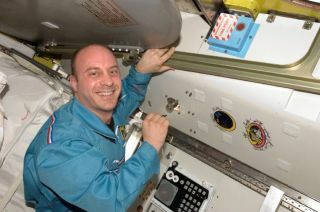 SPACE.com spoke to Reisman about his favorite moments of being an astronaut and whether there's a Dragon flight in store for him in the future. SPACE.com: Congratulations on your new gig! What prompted the move? Garrett Reisman: That's the big question. It's hard to give you a succinct answer to that. 'Cause being an astronaut, I'll be totally honest with you, is the coolest thing ever and a very, very difficult thing to walk away from voluntarily. And I saw what was going on in the commercial space area and I really believe strongly that this is the future of human spaceflight, and I had a strong desire to get involved with that. So that's really what led me to make this decision, which was not an easy one to make. SPACE.com: What made you pick SpaceX? Reisman: First of all they flew some cheese in space which I thought was really cool (laughs). Before I was an astronaut, I was an engineer. And what you see going on at SpaceX is what an engineer dreams about. It's a place where innovation happens, and it's just a really exciting place for anybody who's into technology and rocket science. So having seen all that and having made the decision to kind of hang up my spacesuit and put my engineer's cap back on, it seemed like an obvious fit for me. SPACE.com: What will your new job entail? Reisman: Well, I'll be working with [former astronaut] Ken Bowersox, he's my new boss. And we're working in the area of astronaut safety and mission assurance. And so my job really is all about trying to make the Dragon and the Falcon 9 as safe as possible so we can put people onboard. There's a bunch of steps that we have to take to get the Dragon ready to carry people. That includes designing the suits they're going to wear, designing seats, displays and controls, environmental support systems. All the things you need for astronauts to sit inside the vehicle have yet to be designed, and I'm looking forward to using my experience with American and Russian space hardware to being able to contribute to those designs. It's something that, from an engineering perspective, I think will be really fun. SPACE.com: Do you think that you're done with spaceflying yourself or might there be a Dragon flight in your future? Reisman: Ha. Well I want to be very clear in saying that that's not my reason for taking this job. If my primary goal was to fly in space again, I could have just stayed where I was, that was the most assured path. But having said that, I wouldn't rule it out. If, one day in the future, it's decided, and I'm asked to do it, it's something that obviously would be very exciting, so I would certainly consider it. But it's not the focus right now for me. SPACE.com: What are some of the highlights from your career as an astronaut that still stick out to you? Reisman: There are a lot of them. But I would have to say, if I had to pick a few specific moments, it would definitely be moments during the spacewalks. I did a total of three different spacewalks and there is nothing quite as exciting as doing a spacewalk, going outside in your own little spacecraft and having your visor full of the planet Earth is an experience I will never ever forget. Astronaut Garrett Reisman spacewalks outside the International Space Station during the outpost's Expedition 16 mission. We have a cupola onboard the space station now and there's a tremendous view through those windows. But now that I've left the agency, I can tell you the truth. We tell a lot of the other astronauts that the view from the cupola is just as good as the view you get when you're outside spacewalking. But that's just something that we tell the guys that don't get a chance to go outside. (laughs). You can't beat it. SPACE.com: There's a lot of debate going on in Congress right now about whether commercial companies will be able to provide safe and reliable vehicles. What would you say to people who question that? Reisman: Well, I would point to the success that SpaceX had in the later part of last year, the first flight of the Dragon and the second flight of the Falcon 9, where they achieved a very remarkable success. The booster performed very well and the spacecraft performed great. It orbited twice and splashed down within a mile of the designated target on the first try. So I think that went a long way to convincing people that commercial spaceflight is a viable future. Especially in lean austere fiscal times, this innovation promises not only to provide a quicker way to replace the shuttle but it also provides potentially tremendous cost savings. I do think people are starting to wake up the idea that this is a no-brainer, that commercial spaceflight is the way to go. SPACE.com: Do you sense a lot of excitement within the astronaut corps about these commercial developments? Reisman: Yeah. Look, we have 65 astronauts and I'm sure everybody has three or four different opinions they can give you on that, so I can't say you know as a unified group what the office position is. But there is definitely excitement, I think especially with the success SpaceX had with that first flight. There are a lot of bittersweet feelings going on right now in the astronaut office, with the end of the space shuttle program. The space shuttle is such a magnificent vehicle, and those of us who have gotten a chance to ride on her really have a deep appreciation for her, how advanced and how wonderful a spaceship it is. And we're sad that only one or two more times will she fly. And so we are all hopeful that there is an American-made replacement craft that will get us back into space and as soon as possible, and as effectively as possible, and as sustainably as possible. And so, looking at the promise and the innovation unleashed by the commercial guys is making a lot of us very, very excited about that future.